This Information is truly Devastating! It is my Dream is to become a Future Rancher. My early childhood development was influenced by visiting the beautiful farms around my area in the state of Ohio. 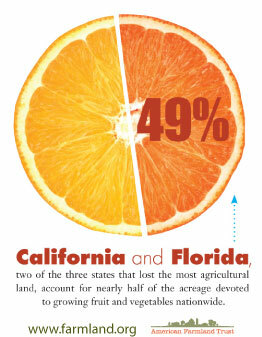 The farming communities produced some of the best crops & people in the world! This is specifically the life that I want for my 2 young daughters, the Nature, the Animals, Sowing the Seeds and Reaping the Harvest, life as GOD himself intended for us live. I strongly believe that type of living is most Healty and Vital for our children today! Sadly it is a rare existance for most children, and with the Millions of Acres of Dissappearing Farmland in America today…What will thier Future Be??? This is very saddening. Like the comment above, growing up reaping the harvest is like nothing else you could teach your children. 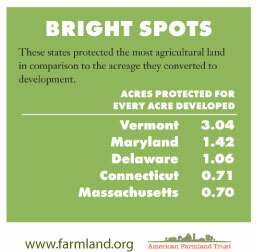 Knowing this, because i grew up on a farm in northern Utah, and all around, the farmland was getting developed, and developed. It sickens me to see it happen. I know that this nation, and our communities, need growth, and they have to have somewhere to do it. 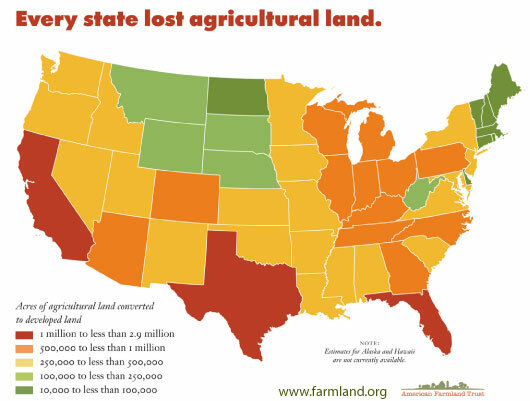 The reason for developing in my mind, is that most farmland is flat, well drained, and quite nutrient rich. All of those, make for good development. But at the same time, if we go ahead and develop all that land, then where will our food come from?? China? What i am getting to is this. Yes, Growth is inevitable, and Yes, the pressures of urbanization are ever so growing. But through programs that protect our vital ground, our grandchildren and their children will hopefully be able to know what agriculture is, whether it be by going just outside the city, or on their family farm. But it is OUR responsibility to protect it, and only we can ever so do that. The time to do that, is NOW!